El Bosco Suites - "The Garden of Earthly Delights"
El Bosco Suites are a unique and delightful collection of apartments that will captivate your imagination! El Bosco Suites are a collection of unique properties positioned in Chapinero Central. Inspired by Hieronymus Bosch´s work (The Garden of Earthly Delights) from the early 16th century. This apartment was handcrafted for people from around the world to experience a special moment afar. This is a self-serviced apartment which will fit 2 guests comfortably. Guests will have access to everything seen in the pictures! Laundry and drying machine, shared with other two apartments. Guests have full access to all the facilities of the apartment and the building. We can provide you with detailed information on what to do, where to go and the best places to eat, drink and visit. Allow us to show you what our city has in store. The apartment can be cleaned on request for an additional cost. Bogota is a big city and late check-ins cost us time and money to get there. There will be a small check-in fee (10 usd) after 8 pm (20:00) or at public holidays. As we are a business, we charge and pay the local 19% sales tax here in Colombia. If you want to avoid paying the tax you will need to present your passport when you arrive so that we can make a copy of the ID page and the entry stamp. This proves you are a tourist, and exempt from the tax. Your concierge will ask to take a photo of these pages at check-in. Check in can be scheduled between 4 pm and 8 pm with no extra charge. After 8 pm and anytime on Sundays and Colombian official holidays, there is a check in fee of 10 USD. 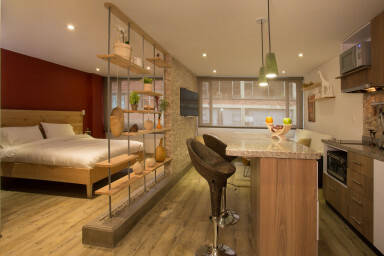 The apartment is located in Chapinero, one of the most central and exciting neighborhoods in Bogotá. It is a culturally diverse hot spot, full of nightlife, commerce, and universities. A definite favorite among visitors to Bogotá. You will have access to the entire apartment. It is your home away from home. Few meters away to carrera 13 and carrera 7. 4 minute walk to Plaza Lourdes. 2 minutes walking to Parque de los Hippies. 10 minutes walking distance from Zona G – the best gourmet zone of Bogotá. Excellent access to the shopping, restaurants, bars and clubs of Chapinero. Mini-Supermarkets and tiendas within a few meters of the building, large supermarkets under 5 minutes walk. Easy access to the North and Center/Candelaria area.